We are again going to the Pine River west of Cadillac, MI. This will be the 2nd Annual PRiBCO. There are camping opportunities at the Peterson Bridge National Forest Campground, Pine River Paddlesports Campground (private), and Coolwater Campground (private). Some of us are going up Friday, October 10 to start the weekend. On Saturday, October 11 we will run shuttle and paddle from Walker Bridge (Silver Creek Campground) to Dobson Bridge, and then return to our camps. Morning rendezvous is at the parking lot on top of the hill above Dobson Bridge on the Pine River at 9:00 a.m. We will leave behind a couple of vehicles to take drivers back at the end of the day and the rest will drive upstream. On Sunday, October 12 we will run shuttle and paddle from Dobson Bridge to Low Bridge. This time we have to rendezvous at 9:00 a.m. at the launch site at Dobson Bridge and unload boats. All vehicles will then drive downstream to Low Bridge and the drivers will get into as few cars as possible and head back to the parking lot. No permits are necessary for the river, but parking permits are necessary at Dobson and Low Bridges. They have self-service sites so make sure you have some petty cash with you. I think it is $3 a day and $5 for two days. The campgrounds should be fairly empty, at least before we get there. Last year we had several other clubs join us and we filled up the campgrounds. It was a great time! 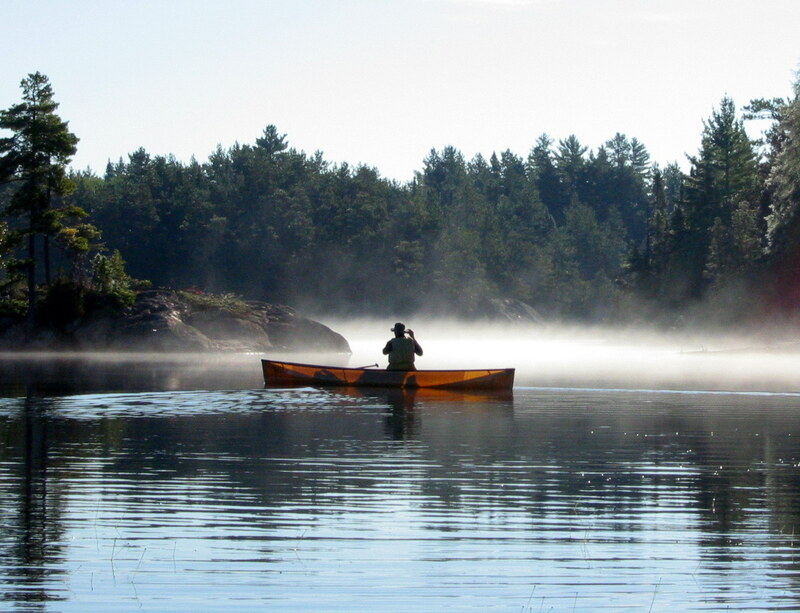 Quietly and without fanfare, we launched from Flack Lake in Canada and paddled west towards Old Baldy, a quartzite mountain peak jutting above the Canadian Shield. A modest headwind impeded our progress but felt fresh in our faces. We portaged into the next small lake and floated right up to Old Baldy’s feet. Quite a sight. First camp on Astonish Lake allowed us to set up and cook before the expected rains came. They were gentle and carressing in their dampness and the lack of wind made for a subtle sound. Dawn brought fog and gradually clearing skies until the sun burst forth in late afternoon as if to forget there had ever been a rain. Second camp found articles hanging on the line to dry in the sun and us baking on the rocks. The heat wave lasted until sunset and then it just grew still. It is always a little unnerving when it gets soundless in the woods. Usually there is always something. A brief howl from coyote/wolf and it was still silent. And then about 4:00 in the morning the little birds started their twitter and it was much more comforting after that. We paddled out on the third day. We didn’t even try to but we ended up nailing the route. It was an athletic effort but we responded to what the woods was offering us and as we were driving home the expected rain hit our windshield before we crossed back into the U.S.
CORUNNA – An Owosso man drowned in the Shiawassee River Thursday after he went over the Heritage Park Dam in a kayak. Charles M. Orgovan, 32, died at Memorial Healthcare shortly after rescuers pulled his body from the east side of the river. Williams said Orgovan was caught in the current just below the more than century-old concrete dam and emergency crews couldn’t get to him until the river kicked him free.Orgovan was unresponsive when rescuers from the Corunna-Caledonia Fire Department pulled him out of the water about 4:25 p.m. Williams warned people to stay away from any dam. According to the National Weather Service, the Shiawassee River was at 6.25 feet at 1:15 a.m. Friday. Flood stage is 7 feet. Acord said rescue crews first were on the west side of the river in the park, but had to go over to the east side of the river to get Orgovan. Williams said Orgovan’s wife and children watched from the west side of the river as he struggled against the current and was later pulled out. The last fatality at the dam was in 1965, he said. Wayne Fickes was doing some handy work outside Johnson & Sons Piano Co. when he saw the commotion. Then he saw a partially submerged lime green kayak floating down the river. “It was so waterlogged, I thought there was a body in there,” he said.– Contact Dominic Adams at 725-5136 extension 239 or by e-mail at dadamsarguspress@gmail.com. It peaked out at about 2200 cfs on Wednesday the 17 and is coming down to today’s flow of 1000 cfs. I ran the river Saturday and it is still flying over everything, with water into the woods on both sides. I am going to run it again on Thursday evening to get as good of an idea of what the river will be like this Saturday for the event. We had everything clear at low water so hopefully anything that floated down kept going. Let me know if anyone is joining me Thursday. The Lansing Oar and Paddle Club will be assisting with advice and safety on the river. LOAPC members have been active all summer clearing the river of obstructions and improving access. Now we will be helping with loading and unloading boats as well as periodically patrolling the river as people float downstream. Please contact me with your availability to participate in this event as part of LOAPC! We will really need the help of ALL who can attend Grand River Environmental Action Team (GREAT’s) Annual Grand River Clean-up Saturday, September 13, starting at 9:00 AM and done by 1:30 PM. The event will be staged at the CMS Headquarters located in downtown Jackson off Cooper St. This is the time to “pay back the river” for all the fun times we have enjoyed paddling it and to keep it healthy for the future. Wear clothes to work in and around the river according to the weather conditions. You may bring your canoe if you have one, but kayaks are of little use as they can NOT hold much debris. GREAT will have its seven canoes there to use, but there is NO need to make any boat reservations. We will also supply brand new work gloves (we have a variety of types and sizes), waders for those who prefer them, garbage bags, and other clean-up tools as needed. We will have bottled water for those who do not have their own water source. Lunch will be provided around 1 PM. To add some fun, there will be prizes for those who collect the most trash (both for working on land and in a boat) and the most unusual piece of trash. Attached, please find a Clean-up flyer to post and/or give to others. Please call GREAT’s phone: 517 416-4234 or Don Nelson, Clean-up Chairman 517 768-6393 if you have any questions or need additional information.